There was a little girl, born way back in 1858, in London. She had several brothers, but as the second-youngest child, was closest to the two brothers nearest in age to her – one a year older, and the other a year younger. She didn’t remember her father, a well-known clergyman and professor who had died when she was two, and although there had been other girls in the family they had all died young, so as the only surviving daughter her destiny seemed to be to spend her life as her mother’s companion. Though her mother was a strong advocate of Girls’ Schools (at a time when these were rare), once her sons’ school expenses had been paid it did not leave sufficient funds to send her own girl to school without adversely affecting the family’s lifestyle. So although the girl saw each of her brothers in turn leave the family home to go away to school, she had to stay and do lessons at home. She developed a wide range of interests – in nature study and botany, astronomy, beekeeping, and in playing the violin. She also learned to ride a bicycle and was noted for her skill at bicycle tricks – and she learned metalwork too. As well as all of this, she learned to help her mother to run the household. This was not easy, as in order to keep up appearances, the houses they had were always more expensive than they could afford – though the boys had scholarships for school, they had to be kept over the long holidays, so to save expense the family home would be let out, and the family travelled the country staying in guesthouses while the boys camped. She had to help see to all the arrangements for this. Gradually, as her mother became older and her brothers had left home, she took on an ever-increasing share of the household management, and such was her mother’s reliance that there was no prospect for her of marriage or leaving home. But there were other hobbies too – her younger brother had become a pioneer aviator in balloons, and later aircraft – within a few years of the first-ever powered flight. And she helped him with this – she helped to source and stitch the fabric for the balloon canopies, and source and repair the aeroplane engines – unusual hobbies for a Victorian spinster, alongside the more conventional charity work she did. Meantime, her elder brother had left school and joined the army. He had a very successful career in the army, and became famous for his exploits in India and Africa, to the extent of being the sort of hero who had memorabilia. Such was his celebrity that a flood of fan letters was a regular occurrence, many being from young boys seeking his advice. His army experiences gave him the idea of starting a training scheme for boys such as those who wrote to him. So he did a test run, and then launched it to the public by way of a magazine. Many people wonder whether he expected it to be only boys taking part in the scheme – given the wide-ranging interests of his younger sister it is possible he could imagine some girls being interested in it – but what is clear is that as soon as he knew there were girls joining the scheme (and he clearly knew this by very early in 1908) he was very positive about them doing so. There are numerous accounts of him giving speeches on Scouting where questions from girls in the audience were welcomed, and he offered them encouragement to start troops, examples of him replying to written requests for Scouting information from girls, suggestions for Girl Scout uniform appeared in the 1908 edition of the handbook, “Scouting for Boys”, and he wrote about and in praise of Girl Scouts in his column in “The Scout” in January 1909 – all well before the Scout Rally at Crystal Palace in September 1909. Although initially the female involvement in Scouting had been overlooked by the public, in an era when militant suffragettes were making national headlines, it was inevitable that any activity which offered girls more freedom than they had hitherto experienced would be viewed critically by the public, especially in a mixed organisation. Although the criticisms were initially a trickle which could be brushed aside as being a few isolated and unofficial cases, it soon became clear that public pressure was growing, and something would need to be done if the positive image of the boys’ organisation were not to be damaged by negative comments about Girl Scouts. Initially, he had approached the first aid organisations, with a view to their organising a scheme of junior first aid orderlies for the Girl Scouts to join. But none of these bodies were interested in taking on this task. Thus his next step was to approached his sister about setting up a girls’ club along the lines of the boys’ group he had created – and she accepted the task. By this time she was in her early 50s. Within weeks she had set up the girls’ club from scratch. She had rented a room from the boys’ club, hired a secretary, and commenced the process of registration. She arranged supply of stocks of uniform and equipment, designed and gained copyright protection for the badges, awards, names and insignias. Although naturally shy, she travelled the country speaking at public meetings and recruiting both women and girls to join the club. She took the handbook for the boys’ club and rewrote it for the girls, utilising a lot of her own knowledge on many of the subjects included. Within 4 years of the club starting the uniforms, handbooks and badges were in place, and she had also launched a group for younger girls. Two years later, she added on a leadership training scheme for young women. Although war soon came to the country, the work continued, with the girls’ club taking on a wide range of war work, such as running canteens, working in hospitals, fundraising for ambulances and ‘rest huts’ for off-duty soldiers, collecting waste for recycling, making and laundering bandages and dressings, working on farms and foraging and preserving food. And yet, when it comes to the credit for the girls’ club, her name is rarely mentioned. Six years after the club started, she was sidelined (against her wishes), and thereafter was rarely invited to events she might reasonably have expected to attend. And though the person for whom she was sidelined undoubtedly did a lot of work over many decades, the credit was not shared between them as it surely ought have been. 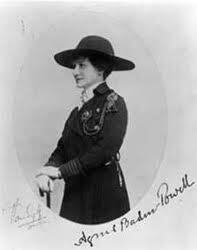 That is why so many people in Guiding who ought to, do not know that the founder of Scouting was Robert Baden-Powell – and the founder of Guiding was his sister, Miss Agnes Baden-Powell. Not Olave – though she served Guiding from 1916 to 1930 as Chief Commissioner and from 1930 to 1977 as World Chief Guide, she had nothing whatsoever to do with Scouting or Guiding in any capacity before 1912, and a limited involvement in the 4 years thereafter. Given that Guides were founded in January 1910, the credit for anything which happened in that early era undoubtedly belongs to Agnes, not Olave. Agnes died in 1945, and was buried in the family grave in Kensal Green Cemetery in London. But – for reasons now unknown, her name was never added onto the family gravestone there. Now, the gravestone is unstable and in need of repair. A group of Leaders are working, with the permission of her surviving family, to try to raise the sum needed to both repair the existing gravestone, and add Agnes’ name to it. But – the bill for the work is £10,000. Wouldn’t it be great if as many Leaders as possible could join the Guild set up for this purpose, help with the fundraising work, and give our founder the recognition she surely deserves? If we work together, perhaps it could be done in time for the Anniversary of her birth in 2018?